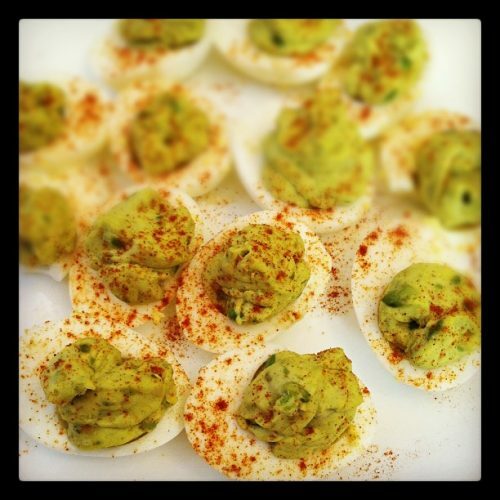 Home Recipes & FoodDinner	Avocado Deviled Eggs you must try! I went to a baby shower this weekend. It was a delightful day seeing friends, giggling over tiny baby clothes and eating lots (and LOTS) of yummy food. As I scanned the table of goodies, I was happy to see the old standby – deviled eggs. But upon closer inspection (ie the little food tag) I realized that these eggs were not the typical old standby. They were special. These were Avocado deviled eggs. And oh. Oh my. They were amazing! When I came home I immediately found the recipe via Pinterest right where my friend told me it would be. I gathered my ingredients and made a batch the next day. Of course they are long gone now, but this recipe isn’t going anywhere! When I posted the below picture, I had a huge response from friends all over my social networks so I decided to dedicate a post to my new favorite snack. Do you have a deviled egg carrier in case you want to take these to a party? Want more? I’ve shared other delicious ways to eat eggs. Yum!! These looks SO good!